An Ubari oasis lake, with native grasses and date palms. Ubari or Awbari (Berber languages: Ubari; Arabic: أوباري‎) is a Tuareg-speaking oasis town and the capital of the Wadi al Hayaa District, in the Fezzan region of southwestern Libya. It is in the Idehan Ubari, a Libyan section of the Sahara Desert. It was the capital of the former baladiyah (district) called Awbari, in the southwest of the country. The Ubari oasis settlement is the second center for the Kel Ajjer Tuareg people, after Ghat. Neighbouring villages include Germa, and Garran. Ubari is located in one of the sunniest and driest areas in the world. It has a hot desert climate (Köppen climate classification BWh) with short, very warm winters but long, extremely hot summers. Average annual rainfall is one of the lowest found on the planet with only 8 mm (0.31 in) and many decades may easily pass without seeing any rainfall at all. Ubari has permanent, unlimited sunshine and clear skies all year-round and in all seasons. Clouds are extremely rare over this bone-dry land. Average high temperatures exceed 40 °C (104 °F) from June to September. 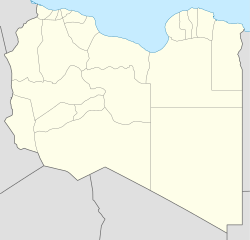 During the 2011 Libyan civil war the town was captured by the forces of the National Transitional Council on 22 September 2011. On 19 November 2011, Saif al-Islam Gaddafi and a few associates were captured and detained about 50 kilometers west of Ubari as they were trying to flee to neighbouring Niger. Following the 2nd civil war, the city has been claimed by independent Tuareg and Toubou tribes. ^ Fahim, Kareem; Gladstone, Rick. "NATO Extends Libya Bombing Campaign". New York Times. Retrieved 22 September 2011. ^ "Gaddafi's son Saif al-Islam captured in Libya". BBC. 19 November 2011. Retrieved 19 November 2011. Wikimedia Commons has media related to Ubari oasis. This page was last edited on 6 November 2018, at 09:53 (UTC).